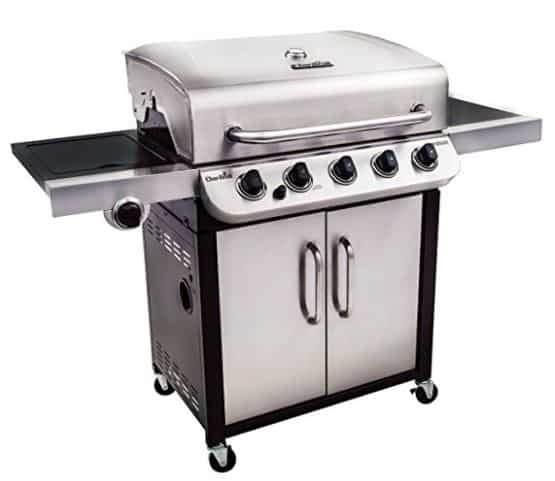 When people ask me about the best value in gas grills I am quick to point them over to the Weber Spirit II grills. However, even the value priced Spirit is a bit steep for a lot of buyers who are looking for the best gas grill under $300. So, if you only have three bills to spend, where should you put your money? 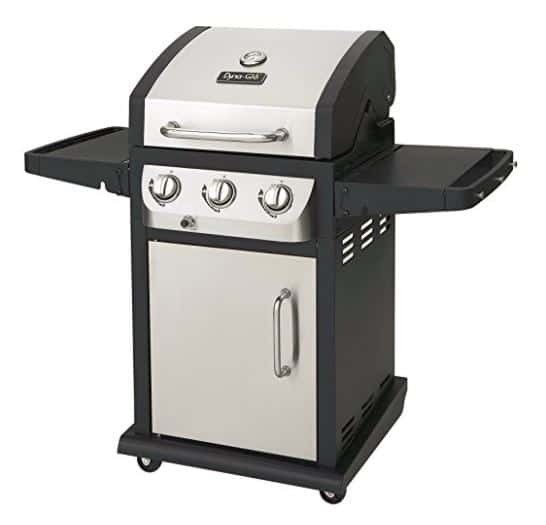 It turns out that there are quite a few nice grilling machines in the under $300 price range. Let me walk you through a few of the options to see if we can find the best grill for you. The Char Broil TRU Infrared grills are the best grills in the Char Broil product line. The TRU Infrared grilling system is a massive departure from standard gas grills. Infrared grills operate at higher heat and have fewer flare ups than traditional gas grills. Food cooks faster and loses less moisture on an infrared grill. Char Broil grills generate infrared heat with a stainless steel plate located directly beneath the grill grates. The heat output of these grills is typically about 65% infrared and 35% convection and I think these are some of the best infrared grills available. Here is a look at how the TRU Infrared grills are different than standard gas grills. 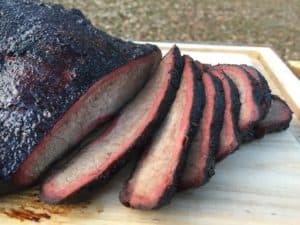 Infrared grilling is not everyone’s cup of tea so it is worth pointing out that Char Broil has some nice full size traditional grills that won’t break the bank. These big grilling machines are a blast and the extra burners give you plenty of flexibility for setting up indirect grilling zones. These come with porcelain enameled cast iron cooking grates which are a serious upgrade compared to the thin crappy grates found on most grills at this price point. 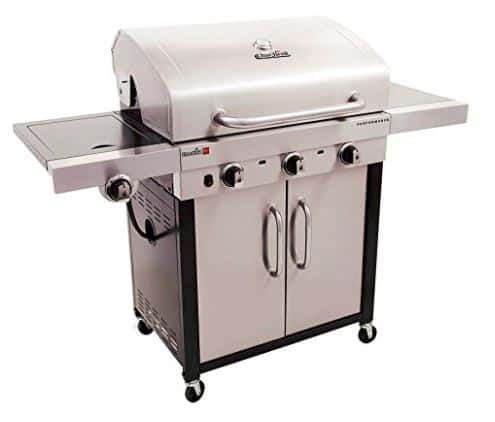 These large grills come with side burners, electronic ignitions and warming racks. Char Broil offers a five year warranty on the burners and a two year warranty on the fire box and lid. Here is a quick video look at the four burner Performance grill that Char Broil put together. The Dyna Glo Smart Space Three Burner grill has a list price of $319 but can always be found online for less. The grill has cast iron grates and 390 square inches of grilling space. The reviews for this grill are extremely positive and it looks to be a budget friendly alternative to a Weber Spirit. Here is a video walk through of this budget friendly three burner. Click on over to Amazon and read the reviews on this guy..you will be impressed. I am a big Weber fan and had to slip this patio grill into the mix. With 280 square inches of grilling space this is the smallest grill in my list. While this is not a traditional full sized grill it is a serious grilling machine backed by legions of fans and Weber’s legendary customer service. This is a perfectly sized grill for when cooking for 2-4 people. To learn more about this grill check out the head to head comparison of the Weber Q2000 vs Q2200. Optional accessories for this grill include a cart, cover and cast iron griddle. Trust me, you are going to use the heck out of the griddle! You probably weren’t even considering a flat top grill but let me give you a sales pitch. These things are AWESOME! 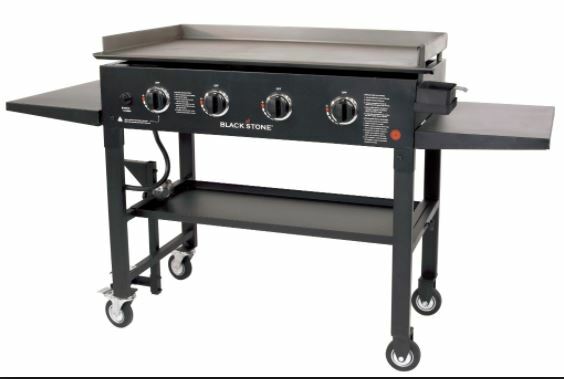 The Blackstone griddles get great reviews and the 36 incher is the best one Blackstone makes. You can easily feed an army with this four burner griddle and cooking on a flat top is a BLAST. I dare you to watch the video below and tell me that you don’t want a flat top grill!